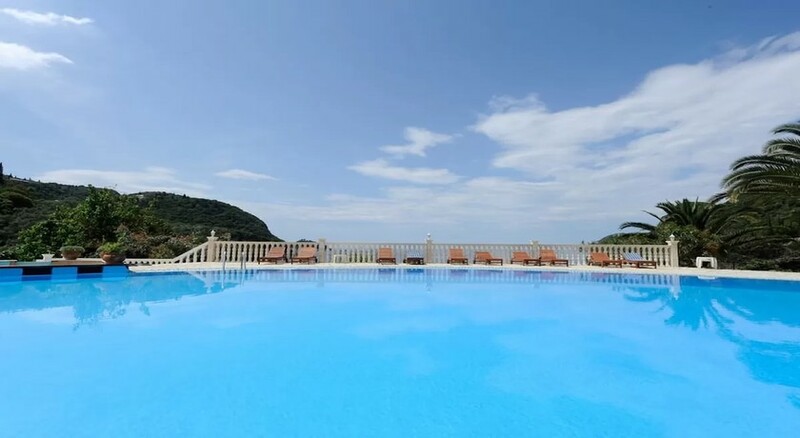 The Blue Princess Beach Hotel & Suites is your ideal Corfu holiday base from which to experience all that this glorious Greek island has to offer. The Blue Princess Beach Hotel Suites is located right on the edge of the dramatic coastline, providing easy access to the beachfront and those lush warm waters. A stay at the Blue Princess Hotel will see you unwinding in luxurious surroundings, with plush guestrooms and suites guaranteed to leave you relaxed and refreshed, while open and spacious with large windows make the most of the sunlight. The Blue Princess Beach Hotel & Suites offers several restaurants, each serving exceptional food, from freshly caught fish from the Ionian Sea to classic, vibrant Greek dishes. You can choose to take full advantage of the watersports on offer simply kick back and relax on the beach or by one of the pools. The Blue Princess Beach Hotel & Suites is located just 23 km from Cofu International Airport. Beach access is a just a matter of a brief stroll down to the seashore. There are several bars and restaurants as well as great shopping to be had within easy walking distance from the hotel. In addition, there are easy day trips to many of the island's main attractions of which the staff at the Blue Princess Beach Hotel & Suites will be more than glad to help you organise. The colour scheme of the rooms is tastefully applied using muted colours which make the rooms feel even larger and more open with each delivering either a sea view or garden view. 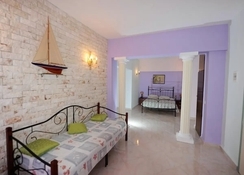 The Blue Princess Beach Hotel & Suites accommodation offers a range of room types: Double Room, Superior Room, Two Bedroom Family Room, Maisonette and Junior Suites. All rooms are fully equipped with all the amenities you'll need for your stay, such as a tea and coffee maker, safe, desk and Wi-Fi with rooms to able to accommodate 4-5 people, great for family stays. Blue Princess Beach Hotel Suites’ flagship accommodation is a 2 Bedroom Villa, complete with a Private Pool, making it the ultimate in luxury accommodation. 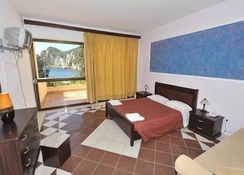 Blue Princess Beach Hotel Suites gives you an excellent choice of dining options. King Alkinoos is the main hotel restaurant open at breakfast, lunch and dinner offering stunning sea views. Thalassa is your go to restaurant for some of the finest and freshest seafood you can find in Cofu. There are two bars located within the hotel, both of which offer a fine selection of beers, wines and spirits to eat in or take away for a relaxing poolside sip. On-site activities include the use of two swimming pools as well as two dedicated children's swimming pools with ample sun beds available to help you enjoy the great Cofu weather. For water activities,. the Blue Princess offers a fantastic selection of activities from its dedicated water sport station. From here you can try your hand at kayaking, pedal boating or go for a dive in the beautiful Ionian Sea with fully qualified PADI instructors. hotel needed some safety improvements which I understand they was having. My and my family really enjoyed it although my son fall off a unsafe wall with a 10 foot drop he was running and it was a easy mistake for a child quick trip to a+e and he badly sprained his arm. I would love to go back and see if the refurb worked. The main hotel area is beautiful, however the accomadation based up the hill is very inconeinient and a long hard steep hill climb which even I found difficult and I have good fitness levels. They state that transport is available but I always found that one member of staff was too busy chatting to female customers and looking on his phone then to take us up the hill. The staff were lovely. Food of a good standard and the hotel rooms in the main hotel area were lovely despite the cold water showers which never seemed to improve despite our complaints. The beach area was well kept and with access using stairs. Hotel situated in the middle of no where so if you want to get around and explore out side of the hotel then you will need a form of transport - their are some other local beaches which are stunning and made me wish I had booked there instead. if you want to relax by the beach and stay in the hotel area then this place is idea. Those who need more stimulation then not for you. The hotel is situated in a beautiful bay, however there's a steep hill to get to it. The hotel can arrange car hire or boat hire but we simply walked everywhere, wandering around olive groves and neighbouring villages. Had a very relaxing holiday.